What is an official e-mail? What is a Legal Entity Code? How should I connect to the e-Citizen system? To connect to the e-citizen system, you need to have an ID card and an ID card reader. Where can I find the list of the documents required for the e-Citizen support contract? To see the list of the documents required for signing the support contract for e-Citizen, press here. Why do I get the message ''login failed'' when I try to enter the https://e-citizen.am portal? 1. Check whether CryptoCard Suite Manager is installed and the CCMonitor icon is visible in the right-hand corner of the desktop. 3. Check whether your ID Card (activated with the PIN code in advance) is connected to the computer. * Install Certificate X.509 by double clicking on ARMID(AuthPIN) and ARMID(SignPIN) in CryptoCard Suite Manager. They should be located in 'Trusted Root Certificate Authorities'. 6. If the problem persists, contact EKENG CJSC. Where can I find the guide for e-Citizen system administrators? To read the guide for e-Citizen system administrators press here. What is an electronic digital signature? An electronic digital signature is a sequences of encrypted symbols attached to an electronic document which enables identification of the signer and protects the document from forgery. Where is an e-Signature used? Electronic signatures are used in electronic reports and all kinds of electronic document circulation. How do I get an e-Signature if I am a foreign citizen? To obtain an e-Signature, foreign citizens are advised to call +374 60 464 504 or send the scanned copies of their passport and social services number (social card) to cssupport@ekeng.am. How is e-Signature regulated in the Republic of Armenia? The Law of the Republic of Armenia on “Electronic Document and Electronic Signature”, adopted on 14.12.2004, regulates the relations concerning the application of electronic documents and electronic signatures. The law does not regulate relations concerning the use of electronic versions of a person’s manuscript signature and its copies, and the use of documents signed with them. Can a natural person use their e-Signature on documents of different companies? A natural person can use their e-Signature for different companies, if the relevant contracts have been signed with Tax and other services. Is it possible to modify a document after it has been signed? If you modify a document after it has been signed, the signature will be considered invalid. What does an ID card contain? An ID card contains the holder's biometric data, individual cryptographic keys for data protection, and electronic signature certificates. What do I need to know when I'm getting an ID card? Attention: when you receive your ID Card, please check that the Identity Card number and the “Document Number” on the PIN/PUK envelope are the same. What should I do if I get a second ID Card? After receiving a second ID Card you should apply to EKENG CJSC to ensure the reactivation. What requirements should an ID card reader meet? 1. The device must have a full speed USB connection. 2. The device must be compliant with ISO 7816 standard. 3. The device must support T=0, T=1 protocols. 4. The device must support ID-1 Card. What ID card reader models are there? What programs and operating systems are CryptoCard Suite Manager and JSignPDF compatible with? If you get three error messages when activating your PIN code, the certificate will be invalidated and you will need to apply to the Passport and Visa Office of the Police of RA in order to obtain a new ID card. At any time after the activation, nine wrong entries will lock your PUK code, and you will need to apply for a new ID card. Why are the magenta signs of the certificates missing in Cryptotech Suite Manager? If the magenta certificate signs are missing in Cryptotech Suite Manager, Cryptotech Suite Manager should be reinstalled (it is advisable to uninstall it first, restart your computer and then install it). After reinstalling the software make sure that the missing certificate signs have been restored. Why do I get the message “Your Signature could not be added to the document” when I try to sign MS Office 2010 files? If necessary, the same steps should be performed for the programs Microsoft Office Excel and Microsoft Office PowerPoint. Why do I get Validation Error when signing Ms Office files? If you get Validation Error after signing MS Office files, we recommend that you download and install public certificates. Why do I get error messages while signing MS Office files after service activation? In case of problems occurred while signing in MS Office after service annual activation, please be sure that you did not sign with a revoked certificate previously, as the reason of error messages can be the problem with CRL cache. PC-> start -> cmd -> right click-> run as administrator, enter the text "certutil -setreg chain\ChainCacheResyncFiletime @now" and click Enter. To create a signature on each page in MS Word, click Insert -> Signature Line -> Microsoft Office Signature Line -> Signature Setup - > Ok on each page appropriately. On appeared X--------- lines left click, then press Sign -> OK -> fill in Name Surname or press Select Image to upload a picture -> click Sign->enter Pin code -> Press OK.
Why doesn't the certificate upload when I press Load Keys? If the certificate in JSignPdf does not upload when pressing Load Keys after having inserted the ID card into card reader, we recommend changing the key store type from WINDOWS-MY to WINDOWS ROOT, pressing Load Keys, disregarding the message, then choosing WINDOWS-MY and pressing Load Keys once more. Attention: please also check the date and time on your computer. How to add 2 or more digital signatures in MS Word document? To add 2 or more signatures in an MS Word document, remove the first card after signing, then insert the second one, wait for certificate upload and sign by clicking file® protect document®add a digital signature… first pressing the "change" button and choosing the certificate of the second signatory in the "Sign" window. save the document and afterwards sign. close the document without clicking ‘’save as’’ after signing. To create 2 graphical signatures in MS Word document, click Insert -> Signature Line -> Microsoft Office Signature Line -> Signature Setup - > Ok and insert 2 signature lines. On first X--------- line sign by first card ( left click, then press Sign -> OK -> fill in Name Surname or press Select Image to upload a picture -> click Sign->enter Pin code -> Press OK), then insert the second card, wait for certificate activation and sign first choosing the "change" button in Sign window. How can two or more people sign the same PDF file? In order for two or more people to sign the same file, remove the first ID card from the card reader, insert the second one and press Load Keys in JSignPdf. If necessary, choose the signer’s certificate from the appropriate list. Press Browse in the line Input PDF file and select the already signed file with the suffix “_signed”. Attention. Select Append Signature to existing one otherwise the next signature will be placed deleting the previous one. Open the file after signing it and make sure that the signatures of both the Tax Service and the signer(s) are on the document. How do I change the place and appearance of my e-Signature in PDF files? In order to change the place and size of your e-Signature in a PDF file, activate Visible Signature and press Settings. In the window Visible Signature Settings press Preview and Select and click the mouse to choose the place and size of the signature. Why do I get the error “Signature 1” when I am uploading a tax report? 1. The signature is not active because the annual fee has not been paid. 2. You have obtained a second ID card, which must be reactivated by EKENG. 3. If the signature is active but the report is not uploading, please try to upload it through a different browser (Google Chrome, Mozilla Firefox, etc.). To include a certificate in Adobe Trusted Identity list, right-click on signature, choose Validate Signature -> Signature Properties -> Show Certificate -> Trust - Add to trusted Identities ->OK. To remove a certificate from Adobe Trusted Identity list, click on the document Advanced menu and select Manage Trusted Identities, then choose Certificates from Contacts field and click Edit Trust. To remove a certificate from Adobe Trusted Identity list in Adobe Reader DC, open the Preferences dialog box from Edit menu. Under Categories, select Signatures-> For Identities & Trusted Certificates, click More. Select Trusted Certificates on the left, find a certificate from the list, and click Edit Trust. In opened "Edit Certificate Trust" window uncheck the checkbox 'Use this certificate as a trusted root" and click on OK, as shown in the picture above. Why is ‘Sign with Omnisign’ missing from the right hand side sub-menu of the PDF file? 1. Adobe Reader was installed after installing Cosign Client. 2. Adobe Reader was updated. It is recommended that ARX Cosign software should be re-installed without unistalling the first one. How can two or more signatures be used on the same computer? In case of two or more signatures and CDs, the program may be installed only once. In order to use two or more signatures on the same computer, once the first signer has used their signature, the second signer should click the Log off button in Start-> Programs-> ARX CoSign -> Cosign Control Panel, and sign the same document using another username and password. How can I check the signature's validation and the modification of the document? Choose the Validate Signature submenu from the right hand side menu of the signature and choose the Signature Properties button. A window will appear with detailed information about the signature. How can I sign documents with Adobe Reader if the Sign button is missing? If Adobe Acrobat Professional is not installed on your computer, .pdf files can be signed using OmniSign. How do I use e-Signature for Web services? • Web Services - This enables developers to use Web Services that run inside the CoSign appliance and also enables the platforms and development languages to interact with CoSign through the evolving standard of Web Services. 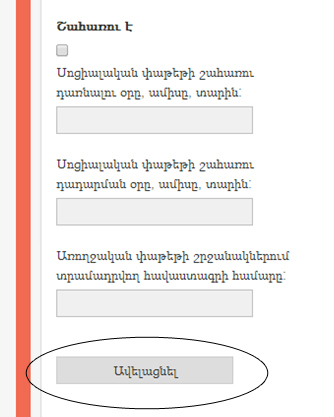 If you are using e-Signature for Web services and SOAP protocols, you may address your official request to EKENG CJSC, 4, Tigran Mets, Yerevan, RA and to send an e-mail to cssupport@ekeng.am in order to receive all the items necessary for the integration. What is the ID card reader software? The ID card reader software is used to read, export and print ID card data without the possibility of making changes. For instructions on how to install the ID card reader software see the ID card reader software user guide. If you encounter problems during installation, please install dotNetFx40_Full_x86_x64.exe before installing the main setup.exe application. To receive a new license, all existing customers should apply to EKENG by sending an email to cssupport@ekeng.am or calling +374 60 464 504. The annual license fee is 10.000 AMD. How do you register a new employee in e-Repository? 4. Fill in the “Personal data” fields for the employee, check the checkbox “Beneficiary”, fill in the dates, press “Add”. Why do I get the message “The user is already active”? The message means that the user is already active; that is, the user has already activated their login name by pressing the link sent to them. If you lose the password for E-repository, enter your login name and press “Forgot Your Password”. A window will open. Enter Login name and Social Service Number(Social Card number) and press "Send an e-mail". An e-mail will be sent to the e-mail account registered during the activation of your login name, with a link to reset the password. Press "here" in the e-mail. Attention. If you read the e-mail late, then an "Activation code time-out" message will appear when you press the link. To reset your password you will need to repeat the same steps. After pressing the link "here" a new window will open. Enter your new password in the line "New Password", re-enter it in the line "Repeat the password" and press "Change". When you successfully finish the password reset, the login page will open. You should enter your login name and new password. To export the list of registered employees, press Find an employee and press Export CSV. The list can be filtered to include only dismissed employees, beneficiaries or non-beneficiaries. If no checkbox is checked, no filter will be applied, and the entire list will be exported. The file is exported in CSV format which should be opened with MS Excel. Why do I get a Line two mistake? Select Control Panel > Region and Language > Formats, and then select English. Then click on Additional Settings > Decimal Symbol, and if you see a comma, replace it with a dot. Why do I see Social Security Numbers (SSN) in red? SSNs in red mean either that the employee is not registered or that the SSN is wrong. How to check e-Signature in MS Office files? Adding a digital signature to an MS Office document a small red ribbon icon is displayed at the bottom of the page to confirm that the document has been signed. Right-click on the icon, press Signature Details and the necessary information will appear. How to install public certificates? If you get Validation Error after signing MS Office files, we recommend that you download and install public certificates: ekeng.am -> Download Software-> EKENG Certificate Installation. Press on EKENG certificate installation.exe, choose the appropriate language and finish the installation. In case of occured problems, the certificates should be installed separately. Please visit the page ekeng.am -> Documentation-> Technical Documents and Programs and be sure to install the certificates in the folder Trusted Root Certification Authorities (Press Install -> Next -> Place all certificates in the following store->Browse and choose Trusted Root Certification Authorities ->Next->Finish). How to check e-Signature in PDF and MS Word files? To check e-Signature in PDF, click the Signature Panel button in the document message bar. Right-click on signature field, press Show Signature Properties ->Show Signer’s Certificate and be informed about the time the document was signed as well as signer details. To get acquainted with e-signature validation steps in MS Word files, please click here for User Manual. Why do I get Recoverable Error in MS Office documents? In case you get Validation Error after signing MS Office files, we recommend that you download and install public certificates: ekeng.am -> Download Software-> EKENG Certificate Installation. Check "How to install public certificates?" in our FAQ. The solution mentioned above is not effective for MS Office 2016. Here the certificates should be installed not in Trusted Root Certification Authorities but in Trusted People folder. Open Crypto Card Monitor, double click on ARMID (AuthPIN), then on Certificate: X.509, press Install -> Next -> Place all certificates in the following store-> Browse and choose Trusted People ->Next->Finish. The same steps should be conducted for ARMID (SignPIN). In case of failure, please restart the PC. Is it possible to combine documents after signing? If you merge or make other changes to signed documents, the signature may change or be deleted, as a result of which it will be considered invalid. If you wish to merge and sign different documents, you should first merge them, and then sign the final document or the pages of your choice.